Net-zero energy is an influential idea in guiding the building stock towards renewable energy resources. Increasingly, this target is scaled to entire communities which may include dozens of buildings in each new development phase. Although building energy modelling processes and codes have been well developed to guide decision making, there is a lack of methodologies for community integrated energy masterplanning. The problem is further complicated by the availability of district systems which better harvest and store on-site renewable energy. In response to these challenges, this paper contributes an energy modelling methodology which helps energy masterplanners determine trade-offs between building energy saving measures and district system design. Furthermore, this paper shows that it is possible to mitigate electrical and thermal peaks of a net-zero energy community using minimal district equipment. The methodology is demonstrated using a cold-climate case-study with both significant heating/ cooling loads and solar energy resources. Bucking, S. (2017). 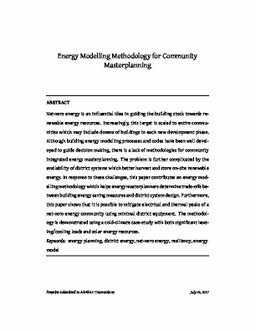 Energy Modelling Methodology for Community Masterplanning. In ASHRAE Transactions.